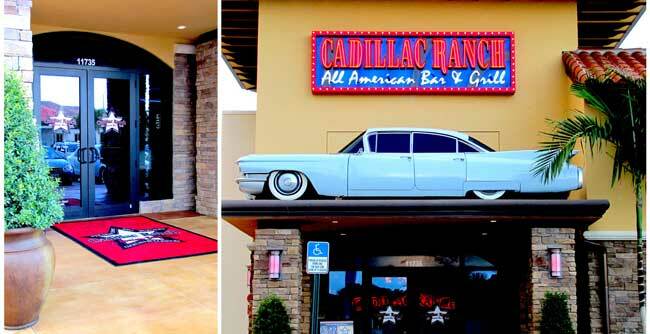 The Cadillac Ranch, new to the Palms at Kendall Town & Country, rustles up good grub, cocktails, bull-rides, and a Rock & Roll Happy Hour. The food at this all American bar and grill consists of steaks, chops, BBQ, flatbread pizzas, burgers, and more. Neon lights, horn chandeliers, hubcaps and guitars, a bull riding area, large flat screens, and of course, an old vintage Cadillac right over the entrance make up the atmosphere. There’s also an outdoor bar and seating area overlooking the water, complete with string lights and outdoor fire pits for cooler nights (when we have them). Kick back with an appetizer (starting at $6.99), which include onion rings, loaded fries, chicken tenders, wings, quesadillas, and tacos, to name a few. 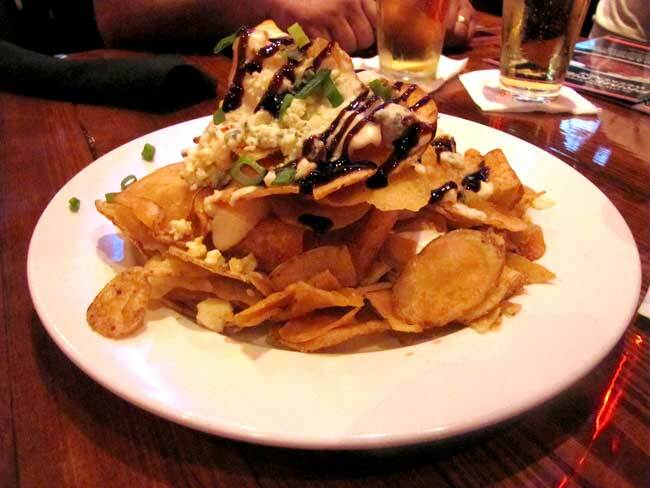 Your best bet is the Kettle Chips ($7.99) with garlic sauce, blue cheese, scallions, and a Balsamic drizzle so good you may want to ask for some extra. Soups and salads (starting at $3.99 and $4.99) are also available. The burger and sandwich selection is plentiful. Try a Turkey Burger or Meatloaf Melt (each $10.99) for a special treat. Flatbread Pizzas are $10.99, available is your choice of Margherita, BBQ Chicken, Buffalo Chicken, Pepperoni Grilled, and Hot Hawaiian. The steaks are cooked to perfection. The Sirloin, at $15.99, gives competitors a run for their money. The more adventurous may want to try the Candied Pecan Pork Chops ($12.99), or the Ranch Mac ‘N Cheese with blackened chicken and baby mushrooms ($13.99). Seafood lovers will love the choice of Tilapia ($14.99), Atlantic Salmon ($16.59), Newcastle Fish & Chips ($10.99), or Spicy Shrimp Pasta ($16.99). 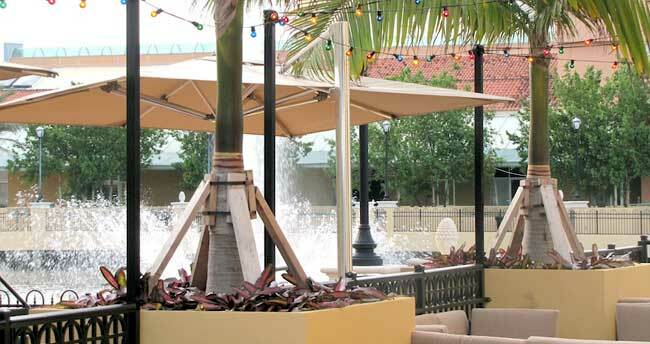 The Cadillac menu boasts that many of their dishes are Gluten Free and/or under 550 calories. Desserts start at $5.99 and include the Caddy Brownie with vanilla ice cream, Carmel Apple Crisp, Cherry Cobbler, and a Raspberry White Chocolate Cheesecake Brulee. They offer a $4.99 Kids Menu for those ages 12 and under, and kids can eat free on Tuesday nights with each adult entree purchase. The weekday Rock & Roll Happy Hour (5pm-7pm) offers special deals on drinks, such as All 16oz. draft beers for $2, house wines at $3, premium cocktails for $4, and martinis for $5. Their lunch menu features $7.99 combos; great for those working or playing in the area midweek. Dust off your cowboy boots, wear bull friendly jeans and tell the Cadillac folks that you heard about them on GreatFoodList.com. Hours Sunday through Tuesday, 11 a.m. – midnight Wednesday and Saturday, 11 a.m. – 4 a.m. Happy Hour ($2 draft beers, $3 house wines, $4 premium cocktails & $5 martinis) Monday through Friday, 3 p.m. – 7 p.m. Lunch Menu Available Monday through Friday, 11 a.m. – 3 p.m. The Cadillac Ranch boasts of a Gluten Free menu, however, I ordered a NY Strip last night listed as gluten free, and it was covered in gravy.. I ate a little bit of it before I realized that this could contain flour, so I asked the waitress,, and YES the gravy was made with flour.. THANK GOD I didn’t eat the whole thing I would have been extremely ill. I did get a little sick later. They made me another one and picked up the price of the steak. My problem is this.. They clearly had no idea what gluten free even means. I even talked to the manager and they were clueless. This could be a law suit just waiting to happen for them.. Celiac Disease is NOT something to take lightly..
Hi Chris thanks for sharing this with our online friends!